Citing his strong interest in Texas history, especially the history of The University of Texas, Austin businessman Clyde Rabb Littlefield has announced a significant bequest to establish an endowment to create an archival position in Texas and university history at the Briscoe Center for American History. "Clyde has personally worked with our university and Texas history collections for many years, and he has deep personal knowledge of this material, especially on the university's early history," said Don Carleton, executive director of the Briscoe Center. "I am deeply moved by his generosity. His foresight in providing for the care of these archives in perpetuity ensures that the collections will continue to grow in size and scope, as well as being exhibited across campus and used for teaching." The University Archives consists of more than 4,500 linear feet of materials that include institutional records, the papers of prominent professors, official communications, and student publications. 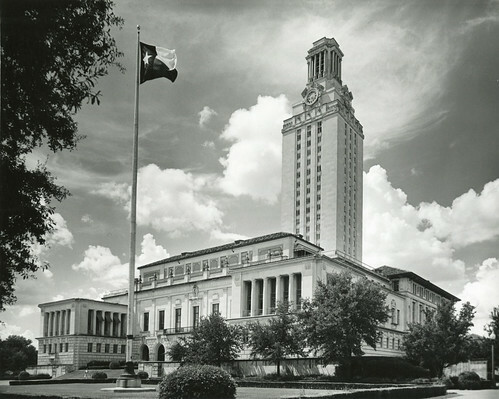 Among its cornerstone collections are the records of the Chancellor's Office, the Board of Regents, the Office of Public Affairs, and the President's Office, all of which trace the development of the university and the many decisions it has faced amid some of Texas' most important cultural moments. "UT has been at the heart of the Texas story since reconstruction," said Littlefield. "I'm interested in cultivating an institutional history that deals with people. I want to see the ideas and people that made this university what it is today elaborated on so we can better understand the history of both the university and the state." Littlefield is a native of Austin with two degrees from The University of Texas. His father and namesake was a track coach at the university for 40 years and helped establish the Texas Relays in 1925. Littlefield graduated in the spring of 1953 with a Bachelor of Arts degree in government. He was a member of the Air Force ROTC and was commissioned as an Air Force officer during the Korean War. He later returned to UT, where in 1958 he graduated with a Master of Arts in government. He spent most of his career traveling the world while working as a civilian historian for the Air Force. Upon retirement in 1980, he returned to Austin and embarked upon his current career in real estate investment and property management. He spends much of his free time researching the first decades of The University of Texas, especially the origins and fates of a wide range of individuals who shaped its early history. The Briscoe Center has launched a digitization project to comb university collections for items of importance and interest that can be added to the center's digital media repository. Major themes of the project include campus and building history, civil rights and desegregation, counterculture and student protest, athletics, and issues related to women, gender and sexuality. More than 1,000 items have been digitized so far this academic year. Additionally, the project has helped determine which of the center's university collections are in need of extra processing and cataloging. Finally, there is currently a collaborative effort among departments on campus to better use archival materials for research. Students and teachers are now using the center's University Archives more than ever. "Thanks to Clyde, this increased interest in the University Archives is a trend that shows no sign of reversing," said Brenda Gunn, director of research and collections at the Briscoe Center.